Inductance is the effect caused by the magnetic field when electric current passes through a conductor. During inductance , time varying magnetic fields develop in the conductor due to changes in current flow. The unit of Inductance is Henry and the symbol used is L to honour the Physicist Heinrich Lenz. The components inducing inductance are called as Inductors which are mainly coils that are capable of concentrating magnetic field. 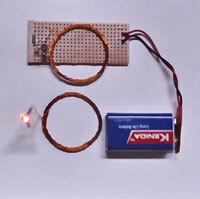 With this simple circuit, you can confirm the flow of current through AC wires without touching the hot wire. It is an ideal circuit to monitor Laptop charger, Battery charger etc. 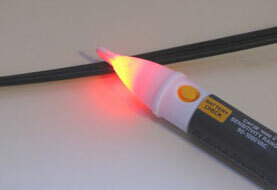 It is also useful to check the flow of current in concealed cables. The circuit gives an LED indication from a distance of 15 cms if current is flowing through a live wire. EMC is the ability of Electronic or Electrical equipment to operate in their intended electromagnetic environment. Most of the electronic equipments are designed to operate within a defined margin of safety and performance without causing breakdown due to the interference of electromagnetic field.